Time for Churches of Christ to Fellowship Other Groups? This is a hard post to write. I realize what I’m about to say may be misunderstood or misconstrued. But as difficult as it is to find the right words, this is something that must be said. In fact, I believe there is no greater issue facing the church today. 1. Shall We Abandon Logic? One of the fundamental laws of logic is “the law of noncontradiction.” This “law” helps us understand that something cannot be true and not true at the same time. In other words, when a religious doctrine says something is true and another religious doctrine says that same thing is not true, they cannot both be right. Someone must be wrong. In the religious world today, we have thousands of contradictory doctrines. In order for us to believe every religious group is right, we would have to accept that religious doctrines could be true and not true at the same time. That’s simply illogical. So as politically incorrect as it may be, someone must be wrong. Take for instance the fundamental issue of baptism. 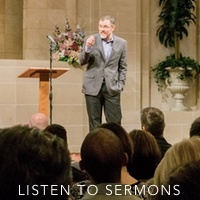 I teach that baptism is “for the forgiveness of sins” (Acts 2:38), that baptism – in a sense – “saves you” (1 Peter 3:21), and that baptism is the moment at which sins are washed away (Acts 22:16). But the vast majority of the religious world disagrees. They say baptism is not for the forgiveness of sins and that it has nothing to do with salvation. The law of noncontradiction helps us to understand that we can’t both be right; one of us has to be wrong. Therefore, it would be illogical for me to teach that a person becomes a Christian when he is baptized for the forgiveness of sins and yet embrace, as my brother, someone who rejects being baptized for the forgiveness of sins. In embracing him in fellowship, I would essentially be holding to two contradictory doctrines at the same time. 2. Shall We Abandon Convictions? Those who tell me churches of Christ must fellowship other groups say it is a matter of humility. They say we are being arrogant for not embracing everyone. “How dare you,” they say, “assume you are right and other people are wrong.” But doesn’t everyone assume their own position is right and that contradictory positions are wrong? Isn’t that what it means to be a person of conviction; to be confident that what you believe is true? A person can be both confident and humble at the same time. You see, it is my conviction that a person who is not baptized for the forgiveness of his sins is not yet a Christian. I suppose I could be wrong about that. I have been proven wrong before and I’ll most likely be proven wrong about something again. But until someone can prove to me why my convictions are false, I have no choice but to stand boldly and confidentially upon them. It seems it is becoming more and more popular to lack conviction and encourage others – under the guise of humility – to abandon their convictions as well. Is that really what God wants us to do? Does He really want us to be a people with no conviction? Does He want us to believe that Truth is unknowable; or worse, that there is no such thing as absolute Truth? Of course not. God wants us to be a people who are anchored in Truth. He wants us to be a people who are bold and confident; without being arrogant or haughty. He does not want us to be “tossed to and fro by the waves and carried about by every wind of doctrine” (Ephesians 4:14). I‘m humble enough to admit my position might be wrong, but not so lacking in conviction as to assume it couldn’t possibly be right. 3. Shall We Abandon Scripture? This third question is the absolute most important point. The popular view of Scripture is that it is so vague, confusing, and open to interpretation that no one can truly figure out God’s will. What does such a view say about God? It says God is a poor communicator. But I reject that view. I believe God is the perfect communicator. I believe God has communicated clearly and precisely. There is nothing wrong with how God communicated His will to mankind. The problem lies with our hearing, not His speaking. Paul says if we will be transformed by the renewing of our minds, we will be able to “discern what is the will of God” (Romans 12:2). God’s will is understandable, if we will be transformed in our thinking and submit ourselves fully to Him. For instance, when it comes to baptism, how much clearer could God have been? “Baptism, which corresponds to this, now saves you, not as a removal of dirt from the body but as an appeal to God for a good conscience, through the resurrection of Jesus Christ” (1 Peter 3:21, emphasis mine). “Whoever believes and is baptized will be saved, but whoever does not believe will be condemned” (Mark 16:16, emphasis mine). “For as many of you as were baptized into Christ have put on Christ” (Galatians 3:27, emphasis mine). I’m not willing to claim I have arrived at a perfect understanding of God’s will. In fact, I’m quite confident that I have not. But there are matters in Scripture that are as clear as can be. Again, my convictions could be wrong, my logic could be faulty, but God’s word is never wrong (John 17:17). Until someone can show me that baptism is NOT “for the forgiveness of sins” (Acts 2:38), I cannot change my mind or embrace those who reject this simple truth. Can There Ever Be Unity? I desperately want unity. I desperately want all who believe Jesus is the Christ to be one. More importantly, that’s what Jesus wants (John 17). But in order for that to happen, we must come to an agreement on some things first; namely, how a person becomes a Christian in the first place. Please understand what I’m saying here. Every disagreement should NOT be a matter of fellowship. Some matters are “weightier” than others (Matthew 23:23). One extreme says, “No matter how vast our differences, we are all Christians. There is no such thing as apostasy or heresy.” But on the other end of the spectrum, there are those who say, “If you and I disagree – on anything – one of us is not really a Christian.” We must avoid the illogical position that everyone is right, while also avoiding the other – equally unbiblical – extreme. I’ve said it before and I’ll say it again, a sign above a church building door does not make a congregation a church of Christ. A congregation of people is a church of Christ if they are Christians and are following Christ. I am more than happy to embrace, in Christian fellowship, anyone who is a Christian and is doing their best to live for Him. And with those who are not yet Christians, I want a dialogue. I want to study through these issues. I want us to come to a common understanding. If I’m the one who is wrong, then show me where I’m wrong and I’ll change my mind. 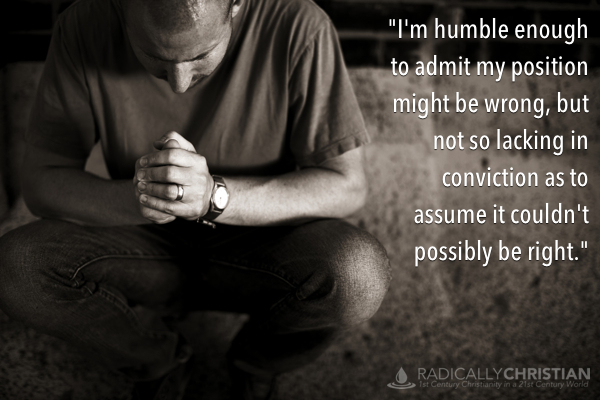 But please don’t ask me to abandon logic, conviction, and Scripture in order to say everyone is right.